Easter Fun & Fantastic Holiday Food! Easter is coming quickly and Ream’s Food Stores has great deals and fun ideas to help you celebrate the season! Easter decorations bring life, fun, and excitement to your home. 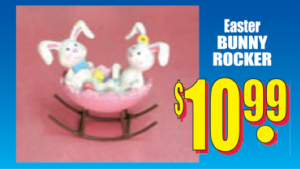 From March 13 – March 19, Ream’s Food Stores has wonderful Easter decorations on sale! Check out this Easter Bunny Rocker for only $10.99! 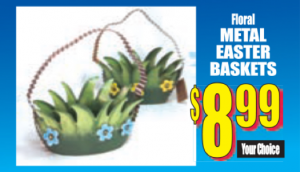 We have an assortment of Beautiful Floral Metal Easter Baskets for just $8.99! 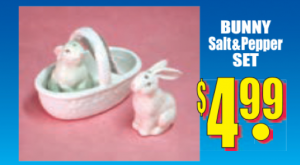 This adorable Bunny Salt & Pepper Set is only $4.99! These and many other fun Easter Decorations are available this week! Shop more Easter Deals here! We look forward to dyeing Easter Eggs every year! What we don’t look forward to is the smell of vinegar wafting throughout the house! With this awesome Kraft Kool-Aid Recipe, you get all the fun without the nasty smell! Prep time is only 20 minutes! 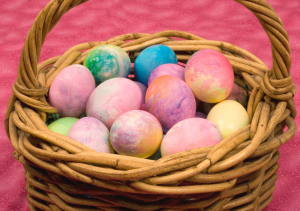 Gather the kids together and put on some groovy tunes; we’re going to make Tie-Dye Easter Eggs! Then, follow the instructions here for your fun, easy Tie-Dye Easter Eggs! What would any holiday be without great food? When you’re looking to gather your family around a delicious Easter feast, Ream’s Food Stores has you covered! Stop by our meat department for premium cuts of top-quality meats. 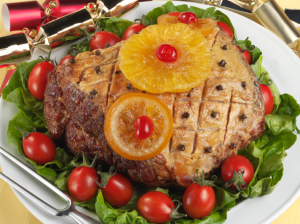 Then, follow the instructions here to create a holiday ham that’s sure to become your new Easter tradition! 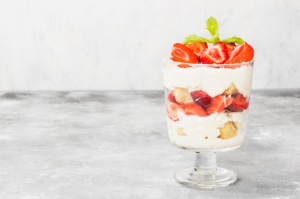 Top Off Your Easter Feast with a Layered Strawberry Cheesecake Bowl! Use these simple instructions to whip up what will surely be the crown jewel of your family’s Easter Feast! Have a Happy Easter – from all of us at Ream’s Food Stores!